Docker ready – what is Docker? I2C ready and tested with small 16×2 LCD. Basic i2c tools included. 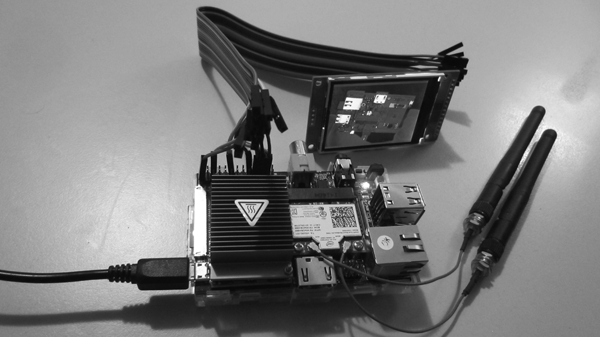 SPI ready and tested with ILI9341 based 2.4″ TFT LCD display. Drivers for small TFT LCD display modules. I tried two different display connection types: I2C and SPI. Both are working perfectly with my image 2.6 or higher. Wire according to this map. You have to use Armbian 1.5 or newer. Currently working only under Legacy kernel. How to control HummingBoard GPIO from kernel space? Wireless adapter with DHCP ready but disabled (/etc/network/interfaces, WPA2: normal connect, bonding / notebook or AP mode). It can handle between 40-70Mbit/s.